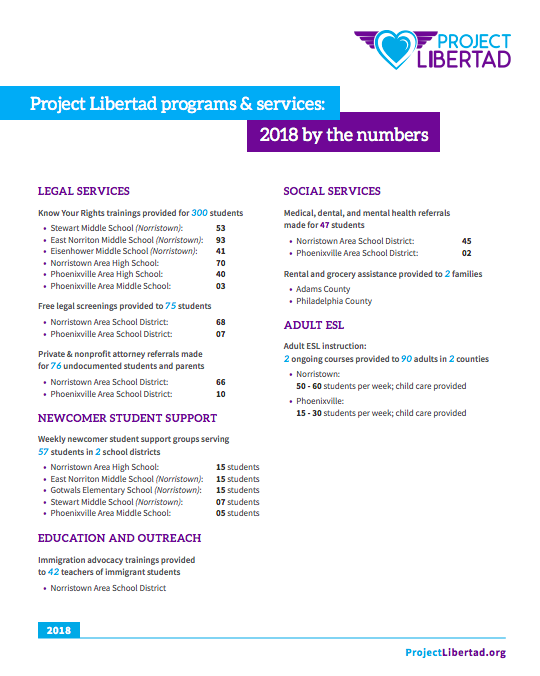 2018 was a busy, whirlwind year of growth and progress for Project Libertad and all of our students! We went from having just one after school program in one school district to having five after school programs in two school districts, with a sixth in progress! We started up two brand new ESL classes for parents of our students. We even received our first grant from PA is Ready! to provide free legal services to our students and their families, in collaboration with HIAS Pennsylvania. Below, take a look at some of our favorite moments from 2018, and our annual report, which breaks down the work we've done this year. We can't say thank you enough to all who have volunteered, donated, and cheered for us along the way. We can't wait to see what 2019 will bring! Special thanks to Aayush Gupta, a volunteer from our Phoenixville Area Middle School Newcomer Group, for writing this blog post and sharing his reflections on volunteering with Project Libertad! Volunteering at Project Libertad was a highly rewarding experience, due to the fact that it felt more like being an older brother/sister than anything else. I know myself and my fellow volunteers enjoyed teaching, playing, and discussing with these wonderful kids, and watching them enjoy their time spending it with each other. It was amazing to see how the kids had such a positive outlook on life, despite their difficult time adjusting to life in the US and their potentially difficult circumstances at home. Surrounded by these kids, I was able to reinforce the idea in me that there is always room to learn, grow, and play, no matter your circumstances in life. After working with these kids, I recognize that in whatever political and legal action that a country or institution takes or makes, the mental and physical welfare of kids should always be the top consideration and priority. ​Hi, Maggie here! I started volunteering with Project Libertad last year, and I absolutely loved it! I found out about the organization when I was researching places to volunteer at for one of my Spanish courses. This organization is perfect for anyone who wants experience working with children, practicing their Spanish skills, and/or helping out children who live in their community. For my volunteer work, I mainly volunteered at Gotwals Elementary in Norristown, PA. The kids in this group were super energetic and enthusiastic. Although at times it was a little difficult getting them to pay attention and participate, it was obvious that every single kid wanted to be there, and each one of them had gained better English skills, confidence, and lasting friendships. It can be super hard moving to a new country and attending a new school where everything is taught in a different language. With Project Libertad, these kids are able to open up and be themselves in the language most comfortable for them, while sharing experiences and playing with classmates who are living under similar circumstances. The first day, the kids were a little hesitant because they were unsure of what was happening and seemed surprised that the leaders and volunteers were speaking to them and teaching lessons in Spanish. They very quickly warmed up, however, and were eager to participate. It was so rewarding watching them come out of their shells and show their true personalities in a place that was safe and welcoming. The program was weekly and was about an hour long. The first half was spent playing get-to-know you games or, as the weather became nicer, playing soccer or basketball outside. In the second half, we had an English lesson with themes such as food, jobs, animals, sports, family, etc. All of the themes were ones that the students picked out on the first day, which made them more invested and engaged in the lesson. After the lesson, we would hand out snack and do an activity that was based on the English lesson. An example of an activity would be drawing a picture of themselves playing their favorite sport and then describe what they drew in English. The volunteers would split up so there was one or two at each table to help them out. I always loved this part of the lesson, because it was more one-on-one with the students, and I got to better see just how clever and creative they all were. Towards the end of the school year, I also was able to work with some of the middle schoolers in Phoenixville. Although the set up in the program is the same, the experience is much different. The students, though still excited about the program, are much more quiet and laid back. They were also more mature, which means we could do more involved activities with them. The last meeting, I even had the opportunity to lead an environmental science lesson with them, where they had to debate the benefits of using an unused plot of land for economic gain, versus using it for research and preserving it in some way. The students seemed to really enjoy it, and their ideas were super insightful. My experience with Project Libertad has been incredible, and I am so grateful for the opportunity to participate and volunteer in it. I love that the organization is 100% centered around the kids. The founder, Rachel, has a lot of knowledge about Latin America, as well as experience working with individuals and families who have immigrated to the U.S. from Central and South America. This is evident in every aspect of the program, including structure of the meetings, communication with parents, and volunteer training. I would recommend anyone who has the interest and time to volunteer with this organization. 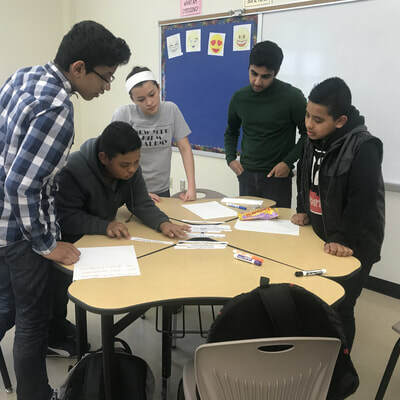 VOLUNTEER PERSPECTIVE: "JAM-PACKED WITH FUN"
As we prepare for the upcoming school year and a host of exciting new projects, we've done a lot of reflecting about our first year of running support groups for newcomer students. We've asked our volunteers to reflect, too, about their experiences working with our students. As a result, over the next few weeks, you'll get the chance to hear about what it's like to work with Project Libertad from the very people who make our existence possible - our wonderful volunteers! "I loved volunteering with Project Libertad! Each day was jam-packed with lessons and purposeful, fun activities to go with them. The kids were always engaged and ready to learn which made volunteering even more rewarding. At the same time, I was learning Spanish, too! While the classroom was a safe haven, time was set aside to talk about what happens outside of the classroom. It touched me to see the students open up about their struggles being immigrants. I felt like I was doing important work when I got to be a part of the current issue conversation. Project Libertad is a fantastic and necessary organization that I will be sad to leave when I head off to college in the fall!" Project Libertad invites you to join us for games, food, and fun at Designer Handbag Bingo in Strasburg, PA, on Saturday, March 10! All proceeds benefit Project Libertad's support programs for at-risk immigrant youth! Special thanks to Victory Church for supporting our cause! WHEN: Saturday, March 10th. Doors open at 11am and bingo starts at 12:30pm. TICKETS: $20 ahead of time and $25 at the door. To purchase, contact maggie@projectlibertad.org. Check out the Facebook event and share with friends! Thank You to All Our 5K Supporters! Thank you to everyone who came out and made our first ever 5K a huge success! We are so grateful to our volunteers, sponsors, donors, and runners for their generosity and support!